The fishing wasn't great but we did see a little action. We only managed one gamefish today (a decent smallmouth), but there were a lot of quillback carp in the hole we were fishing and that made for some fun action to pass the time. I haven't been able to fish much lately, but my Dad has been hitting the river some, and from what I can gather fishing has been rather slow. 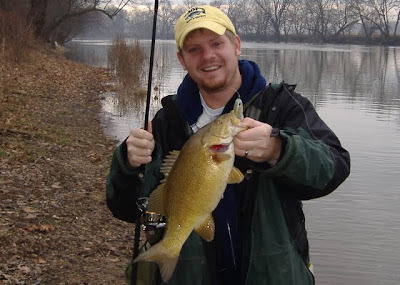 He has been picking up a couple bass here and there and an odd walleye or two, but the action is nothing compared to last year at this time. Hopefully things will pick up soon. The river conditions are pretty good right now, but with the COLD weather forecast for the next week, it's hard to say what might materialize. 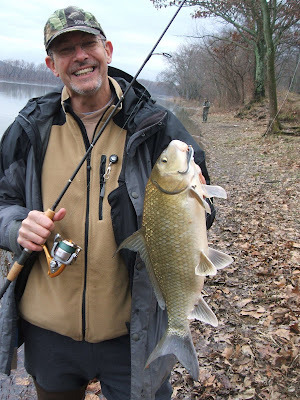 It has been a slow winter so far on the river, but from the reports I have been reading online, it sounds like this has been a great fall/early winter for those fishing the salt water in the mid-Atlantic states. For the most part, we've had reasonably mild temperatures so far which has allowed ocean temps to remain high enough for decent fishing to continue. Unfortunately for me, I haven't been able to do any saltwater fishing since late September, but for all of you guys that have been out there chasing them, I'm envious and I hope you had a very successful fall. I have a couple days off work coming up this week, so I hope to spend some more time on the river soon... If there is anything good to report I'll be sure to post something. Good luck to you all! Maybe I'll see you on the water.